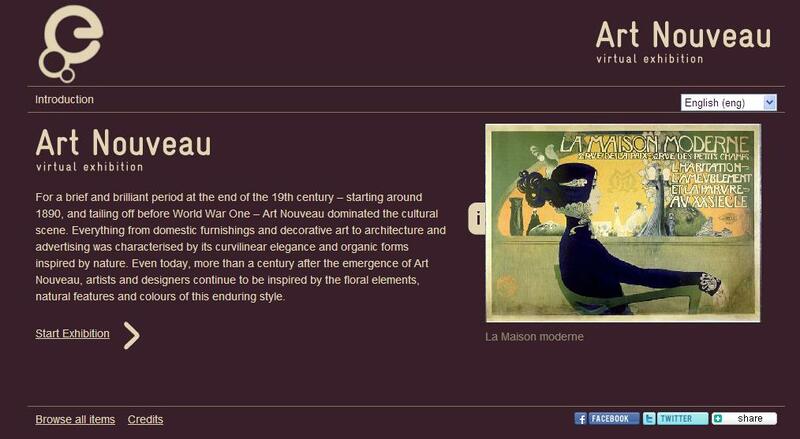 Europeana, Europe’s digital library, museum and archive, has launched two online exhibitions that explore highlights of art and literature – Reading Europe and Reshaping Art Nouveau. Reading Europe: European culture through the book showcases the full texts of 1,000 of Europeana’s most fascinating books, from medieval cookbooks to 18th century English bestsellers. Many literary masterpieces can be found in their earliest printings, including Don Quixote in the first Spanish edition and Dostoyevsky’s The Idiot in the first Russian edition. Visitors can browse richly decorated manuscripts and discover compelling historical works like Jammers Minde – the fascinating 17th century autobiography of a King’s daughter and her 22-year imprisonment in Copenhagen’s infamous Blue Tower. Reading Europe offers a unique opportunity to view literary gems in 32 languages, from Albanian to Yiddish. It was commissioned by Europeana and curated by The European Library, working with experts in Europe’s national libraries. It gives users an engaging introduction to some of Europe’s literary highlights, selected from among nearly 5 million digitised texts on Europeana. Reshaping Art Nouveau takes visitors on a cross-border journey that encompasses everything from domestic furnishings and decorative art to architecture and advertising. It tells the story of how the curved lines and floral themes of Art Nouveau – Jugendstil in German, Stile Liberty in Italian – brought an elegance and a hint of decadence to urban life as it swept through every European capital around 1900. The stories behind the artists and styles are told in a narrative accompanying the remarkable collection of images. These range from the well-loved posters of Czech artist Alphonse Mucha and the stained glass designs of Scotland’s Charles Rennie Mackintosh, to the infamous book illustrations of Aubrey Beardsley and rare photos of fashions designed by Vienna’s celebrated Gustav Klimt. The two new exhibitions unite geographically distant items in a single online space, illustrating how digitisation helps Europe’s citizens explore a shared heritage. Europeana.eu brings printed collections together with paintings, films, sounds, museum artefacts and archival documents in its collection of over 12 million items, revealing previously hidden links and inspirations.